This iconic sandwich is a staple in almost every deli, diner and dive across the country and is stacked high with rich corned beef, butter drenched sauerkraut, rich toasted rye bread and heaping spoonfuls of Thousand Island dressing. As delicious as this sandwich is, it’s not quite what we call diet friendly. In fact, one traditional Reuben has close to 500 calories and 28 grams of fat! Save those calories for something better (like an ice cold beer) and still enjoy a Reuben with this lightened up sandwich recipe. What makes a Reuben is the delicious thick cut corned beef paired with the heavy dressing and cheese. However, corned beef is loaded with fat and regular Swiss cheese can have eight grams of fat per slice! Shave off those calories and fat grams by using turkey and part skim cheese and by making your own skinnier version of Thousand Island dressing! If you must have the corned beef, use only a few slices for flavor and to keep calorie count down. Prepare the sauce by placing all of the ingredients into a blender or food processor. Pulse on low until mixture is smooth and creamy. Add salt to taste. Remove from blender and chill. To prepare the sandwich, spray panini maker with nonstick cooking spray and set on medium-high heat. Spread 1/2 tablespoon mustard on one piece of bread. Place cheese over mustard. 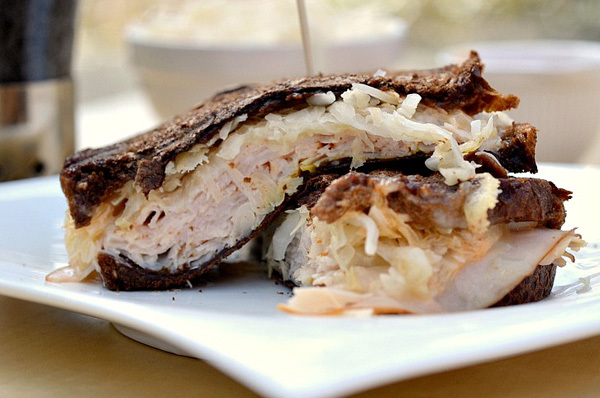 On the other slice of bread, stack turkey and sauerkraut. Place about one tablespoon of dressing over the cheese and put slices of bread together. Place sandwiches next to each other on the panini press. Pull the handle down and cook about three to four minutes or until cheese is melted and bread is crispy. Enjoy with a pickle and a nice cold beer!